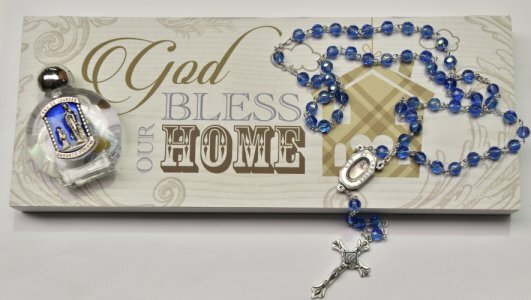 CATHOLIC GIFT SHOP LTD - God Bless This House Gift Set. God Bless This House Gift Set. > God bless this house wall art deco. Wood wall plaque measures 4" x 10" and comes boxed..
> Glass crystal sapphire rosary beads with a Lourdes water centrepiece that depicts the scene of the apparitions, Rosary measures 18 inches approx. > Lourdes holy water bottle, measures 6.5 cm tall (2.5 inches) bottle may differ from picture.